In 2006, New York Times Best best-selling author David Horowitz wrote an explosive book on “The Shadow Party” detailing how billionaire George Soros and radicals from the 1960s took over the Democratic Party, according to evidence he obtained with co-writer Richard Poe—also a New York Times-bestselling author. Now, more than a decade later, Soros’s influence has become increasingly visible in today’s Democratic Party. Horowitz explained in an interview with The Epoch Times how the party has changed completely from its roots. 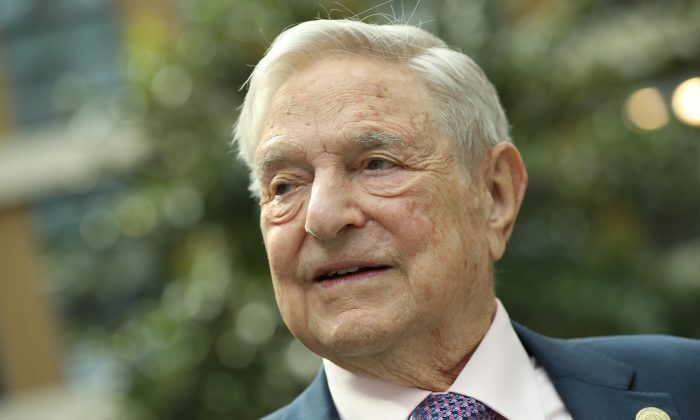 Last year Soros transferred nearly $18 billion of his fortune to his Open Society Foundations, making it one of the world’s largest organizations for political activism. Horowitz said that funding from Soros’s foundations shape much of the culture in today’s American society, but the end goal behind it is much more sinister. “I’m a former radical so I know how sinister and evil and malevolent the left is,” he said. Horowitz said that the changes within the Democratic party first started after Soros bought his influence in the party around the time of George McGovern’s 1972 presidential campaign. Horowitz also describes a strategy called “Above and Below” that Soros and his party have used. Perhaps the most striking example of such a strategy used today is the far-left extremist group, Antifa, whose members are known for wearing all black and concealing their identity with face masks. Despite its name being short for “anti-fascist,” the organization often uses fascist tactics, resorting to violence against conservatives, supporters of President Donald Trump, and other people considered by them to be right-wing.